A team of students from Missouri University of Science and Technology will demonstrate the capabilities of solar-powered vehicles during the Formula Sun Grand Prix 2015. The event will be held Sunday, July 26, through Friday, July 31, in Austin, Texas. Missouri S&T’s Solar Car Design Team will compete against 16 other registered collegiate teams from around the world at the Circuit of The Americas, a 3.4-mile Formula One racetrack. 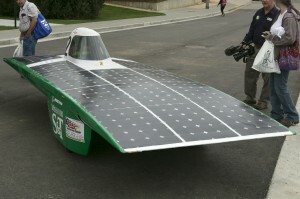 S&T’s student-designed and -built car is named Solar Miner VIII, in the tradition of past Missouri S&T solar car teams. Teams start the event with three days of technical and safety inspections, then move on to three days of racing. Victory at the event goes to the team that completes the most laps over a three-day period. Solar Miner VIII raced in Austin during last year’s competition, but this year the street-legal vehicle sports a redesigned power system that is 40 percent more powerful than the car’s 2014 technology. An upgraded telemetry system transmits the car’s real-time energy consumption and performance data to the team to get the maximum performance from the sun’s power.